Windows Live Essentials 2011 beta (Update for Wave 4) is released and yesterday, some more updates came as well. As the Windows Live Writer is a part of Live Essentials, this time Windows Live Writer Wave 4 (WLW 2010) got couple of improvements and addition as well. I downloaded and upgraded my Windows Live Writer with this latest version and used the same for couple of hours. Here is my review about some newly added features and improvements in Windows Live Writer. 1. Improved Interface – Once you will update the Writer to 2011 beta, you will see a difference in the looks of your current theme. Actually it is because of the fonts size changes. Now your theme layout on WLW will look much cleaner. 2. Improved Spelling suggestion – Spelling check is really important in blogging and this time, Microsoft has improved the spelling check system of Writer. 3. Added lots of Emotions – Yes, now you can insert emotions in your posts. To insert an emotion, go to “Insert ==> Emotions” icon and hit that to get lots of emotions. Just select any of them and that will appear in your post. 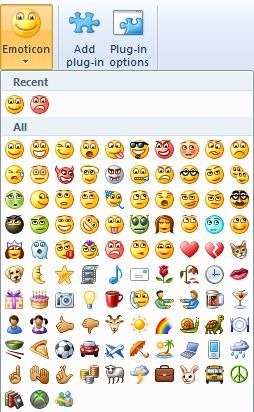 These emotions are actually pictures (nice one) pre-installed in Writer. Once you will upload this post on blog, those emotions pictures will also upload on your blog. 4. Improved Integration with Microsoft Office products – If you want to paste something from Office products like Word, Excel etc. you can do that using Paste Special. But now this integration has improved a lot. You may choose nice formatting of a table in Word and that table can be pasted in Writer with the same formatting. Yes, this “Paste Special” option was there in Writer 2009 as well but now it has been improved a lot and you will not face much issue in that regard. Windows Live Essentials 2011 beta is having lot many new features as well. For example, now Facebook chat is available in Windows Live Messenger. 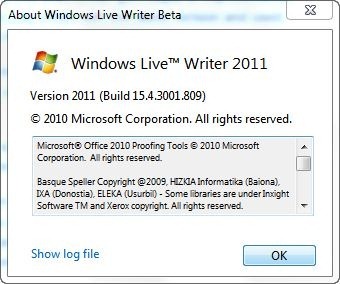 I will share more review and updates about Windows Live Essentials 2011 but right now just done with the hands on review of Windows Live Writer 2011 beta. Go ahead and try the same by downloading WLE 2011 beta from the links below.